We have this item in stock and it will ship out with in 1 business day. 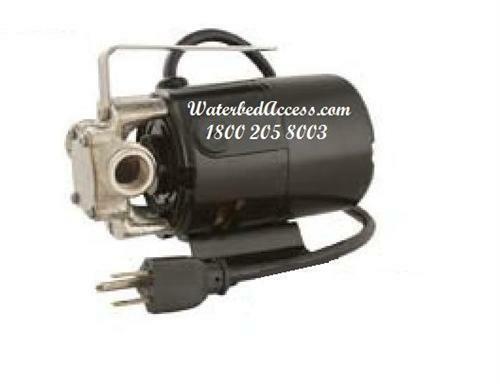 This electric utility pump transfers water, drains all Waterbed mattresses and Pools with ease. Motionless water mattresses require a powerful pump to pull the water from the baffles/fiber/sponge which is the material inside the mattress to reduce the movement. 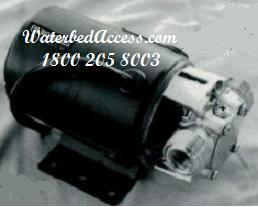 This is the right pump to use for those hard to drain motionless water bed mattresses. Great for RV's and Boats also. electrical cord with a Three Prong Grounded Plug. Plugs into any ordinary electric outlets in the U.S. "Would not work in European outlets" It also uses standard 3/4" quality garden hose. These Reliable industrial Pumps are very Portable and Easy to use. You should never run this pump or any electric pump dry. When the mattress is drained unplug the pump. This item normally ships via Priority post office -which is a fast shipping method-. Hi., AK, & P.R. also gets free shipping for this item. Additional S/H cost to Canada is $19.99.